Click here to send me a comment. This link leads sources for chanting Torah and haftarahs. This has been typeset from scratch in large, easily readable, type using the MAKOR Hebrew typesetting system. It can be freely reproduced and modified on a strictly non-commercial basis. 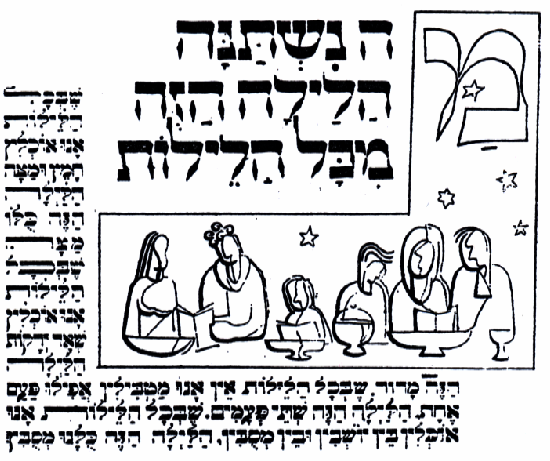 Why is this haggadah different from all other haggadahs? ehchad mee yodeia? Side by side Hebrew and transliteration. An mp3 version of echad mee yodeia?Ⓒ sung by The Tractor's Revenge. chad gadya Side by side Hebrew and transliteration.